"Name Bracelet specializes in Mother Bracelets, Grandmother Bracelets, Family Name Bracelet, Little Girl and Baby Bracelets. Our mission is to design hand-crafted beaded bracelets women love to wear and wear with love. We achieve this by creating a personalized name bracelet, tailored to your style, and designed for you. We believe in making quality beaded name bracelets designed to wear today and treasure forever! " I received a beautifu l Mothers bracelet from Name-Bracelets . It has 3 strands each has one of my sons names and their birthstones. I treasure this bracelet and wear it everyday. I have always wanted a piece of "MOM" jew elry and since becoming a mom over 13 yrs ago this is the first piece I own. When I received my bracelet the first thing I noticed besides its beauty was the quality of materials used and the great workmanship. When you place your order for a Mothers Bracelet, you have two bead type options to choose from: sterling silver beads only or two-tone design with sterling silver beads and 14K gold-filled beads. They offer genuine Swarovski crystals, which can be added to your bracelet at no additional charge. Crystals can be added as birthstones or as accents. Add one or more charms to your bracelet for that added touch of pizzazz. Their charm selection includes, heart charms, cross charms, and baby booty charms. 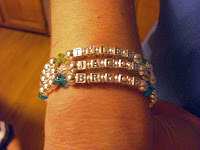 Their beaded Mothers Bracelet prices are straight forward, there is no additional charge for more letters. Birthstone Crystals are also optional at no additional charge. A Mothers Bracelet is the perfect personalized gift. 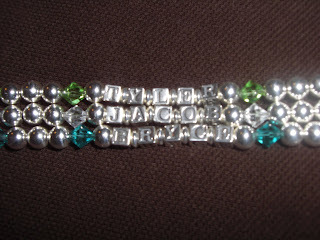 Personalized name bracelets are great for Birthday gifts, baby shower gifts, Christmas gifts and Mother's Day gifts. 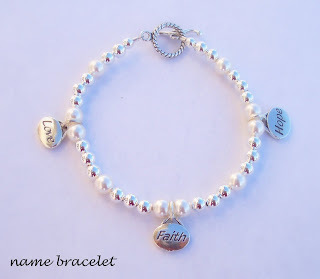 Name-Bracelets has generously donated a Love, Faith and Hope bracelet (see photo below) for one of my readers to win ! The Love, Faith and Hope bracelet is described on their site as : "Love, Faith and Hope are encouraging words for someone who is in the midst of cancer, a spiritual journey or a "just because" gift. 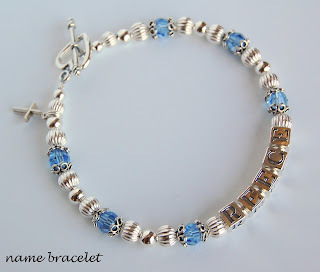 Made of Sterling Silver beads and charms and Swarovski pearls this Name Bracelet gift is a real winner. " Visit Name-Bracelet, come back and tell us what product you like besides the Mothers Bracelet or the Love, Faith and Hope bracelet. I would love the Classic Grandmothers Bracelet with three strands! I love the prize bracelet. They're all beautiful! Luv to win it! I happen to like the name bracelet. 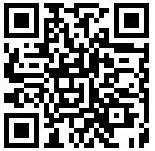 I have your button, you should stop over and see it. I love the double stand family bracelet with the twisted rings over the crystals and the one showed with the green Swarovski Crystals is absolutely the one I want. I like the Mother and Child bracelet. I love the little girl bracelets that have their name and birthstone. What nice birthday gifts this would make. I like the 12 days of Christmas charm bracelet. I like the sterling silver childs classic style with pearls! Sterling Silver Antique Style Child Bracelet personalised with name and birthstone would be my choice. I would love the Three-Strand Grandmother bracelet. That would be for me. Thank you! I like the Grandma Necklace with Swarovski Crystals. I like the mothers necklace. I would love the Grandmothers Bracelets ~ Antique Style ! love faith and hope is what I live by, would love to win this. I love the Mother Necklace with Swarovski Crystals. I love the family bracelet. I love the college bracelet! An excellent gift idea for my daughter who attends college at SMU! I have bookmarked this site now! i just started following you on twitter (bellows22) and I tweeted about the contest! I'm a subscriber by email already! I really love the Mother's Necklace with the Swarovski Crystals, I would get this with my girls' birthstones, so pretty! Thanks so much for such a wonderful giveaway! I love the Strand Sterling Silver Mothers Bracelet ,I would have all 4 of my children. I like the Faith Necklace. I really like the Grandma bracelets! I am subbed at my yahoo email. I also like the Mother and Child bracelet. Thank you for a great giveaway! The family name birthstone bracelet is pretty! Thanks for the chance. i like the customized name bracelet. OMG, I think we may have found our Mother's Day gifts for my mom and my MIL! What a beautiful product! I like the Strand Sterling Silver Mothers Bracelet. I like the Classic Grandmothers Bracelet. I like the Pearl Mother Bracelet. I like the Jack&Jill bracelet. My sister loves the Sterling Silver Faith Charm Necklace. Please accept my entry. Thank you. I like the Faith Necklace - very pretty and I like the symbolism. I love the strands sterling silver Mother bracelet a lot! I love silver!!!!! Great looking jewelry that would make wonderful presents! I like the beautiful Sterling Silver Mothers Bracelets. I like the Grandma Name Necklace. Thanks. Facebook fan - Bonnie Schmeck. The Faith Necklace is beautiful. God bless you. I love the Pearl Mother Bracelet. This kind of jewelry makes such nice gifts! I really like the Faith Name Necklaces, I have so many friends both young and old that would cherish a gift like this! So meaningful and unique! Thank you so much for the opportunity to enter. I love the Mother necklace! I love the Antique Style Grandmothers Bracelets. I really like the Family Birthstone Bracelet! I love the classic grandmothers bracelet. I also like the Sterling Silver Antique Teacher Apple Bracelet.